I love to see the enchanting bouquets brides come up with for an autumn wedding celebration. The fall colors of bright red, orange, yellow, and burgundy contribute to the beauty of both the wedding ceremony and reception. This week’s post is all about incorporating a variety of rich fall colors into a wedding bouquet. Enjoy! 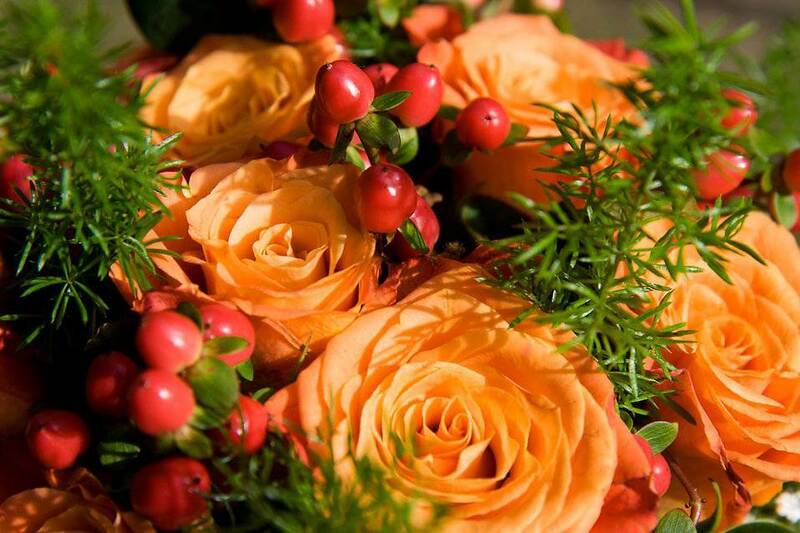 Lots of autumn brides carry beautiful bouquets made up of traditional wedding flowers such as roses and dahlias. 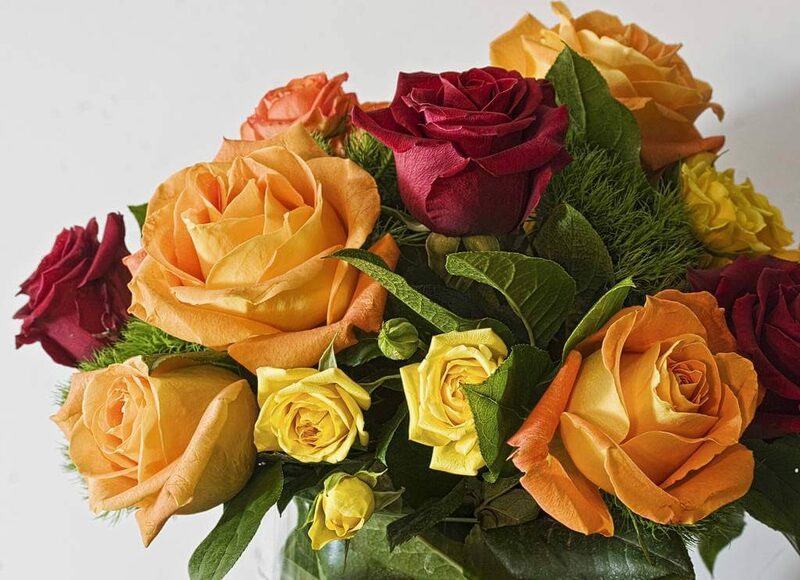 But instead of the pastels seen in spring and summer, these flowers might celebrate the warm tones of fall. For instance, a bride may choose a wedding bouquet featuring deep red dahlias and orange roses. I saw a bride earlier this month carrying a bouquet filled with dusty pink roses and burgundy gerberas. I thought it was a lovely choice. Bright orange marigolds and black-eyed Susans also make a big impression in any bridal bouquet. Along with flowers in warm colors, many fall bouquets include cat tails, berries, branches, and golden leaves. These items lend a variety of textures to a flower arrangement. Some brides like to include wildflowers such as goldenrod that add both fall color and texture to their bouquet. Fresh wheat greens, ornamental grass, and ferns are all examples of greenery chosen by brides to embellish a gathering of blooms. Some brides secure the stems of their bouquet with glittery ribbon, corn husks, or even twine to stay with the textured theme. Choosing flowers of the season for a wedding this time of year is an easy way for a bride to keep her wedding budget under control. Luckily, there are many fall flowers perfect for a wedding bouquet. Nothing epitomizes a fall wedding more than a bouquet of brilliant orange gerbera daisies. 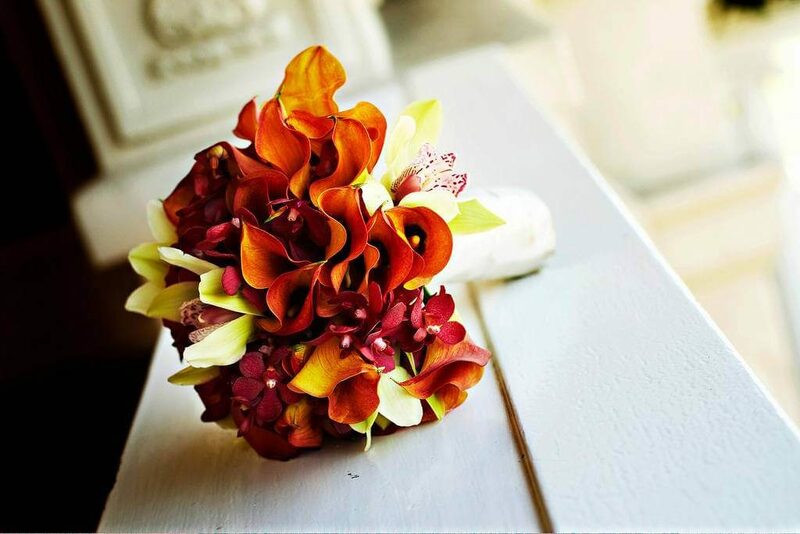 Other fall flowers that are ideal candidates for a wedding bouquet include red gerberas, marigolds, and calla lilies. I think opting for some seasonal favorites is a great idea for any bride who wants to lower her stress level regarding the flowers. Some brides prefer to have a bouquet made up of fall vegetation or items related to the season. One bride may opt for a bouquet of pine cones with a few acorns mixed in for good measure. Another bride may include arrangements of wheat and straw on her reception tables. These look all the more elegant if they are put in ornate vases decorated with ribbon. Of course, there’s always a wheat and corn bouquet for a fall bride who wants an arrangement with a rustic touch. And for brides who don’t want to carry a bouquet of pumpkins down the aisle, there are pumpkin bouquets perfect for the tables at a reception. Carrying a pumpkin down the aisle would be memorable, but maybe not in the best way. I certainly hope this post has given you some ideas if you’re preparing for a fall wedding. I relish all of the rich, deep colors of this season: Don’t you?